The password is one of the common and basic level security techniques used for protecting confidential or crucial data from unauthorized access. With MS Outlook, users are allowed to set a password on their PST files so that nobody is allowed to access its mailbox contents. For all versions of Outlook, users can set a password for the file and stay carefree about anybody accessing their database without permission. But, the database protection through passwords sometimes leaves a user into troublesome situations. This happens because the security code has to be entered with the exact match when prompted. Since the passwords are case sensitive and can contain special characters, there are chances that a user might forget it. But, there is another side too. Sometimes, a PST file is available and its password has to be recovered to read the file contents. This generally happens in scenarios like PST file forensics. The Outlook database seized in the form of PST files is protected with the password and this is when there occurs a need for a PST password removal tool to unlock Outlook PST file. When a PST file is processed with an external utility, the major concern of the examiner remains if the integrity of the database will be retained after password recovery. To work upon such problems, the PST Password Removal tool is developed that ascertains that while the file is processed for password recovery, the data and metadata in it remains absolutely intact. If the system does not have MS Outlook installed, then also the software will remove PST password. It works as a standalone utility and performs its task without installation or configuration of MS Outlook. At a time, the PST Password Removal Tool permits adding multiple PST files. It can be added one by one through “Add Files” option or in batch through “Add Folder” option. When the files are added and they are password protected, the software will display the file with a lock symbol. No matter what kind of password is set on the PST file and of what length, the software will work upon it. Password with special characters can be removed with the tool efficiently. The software removes password from PST file and makes its contents available for forensic investigation. The tool eliminates the password so that a new one can be added to the same file. 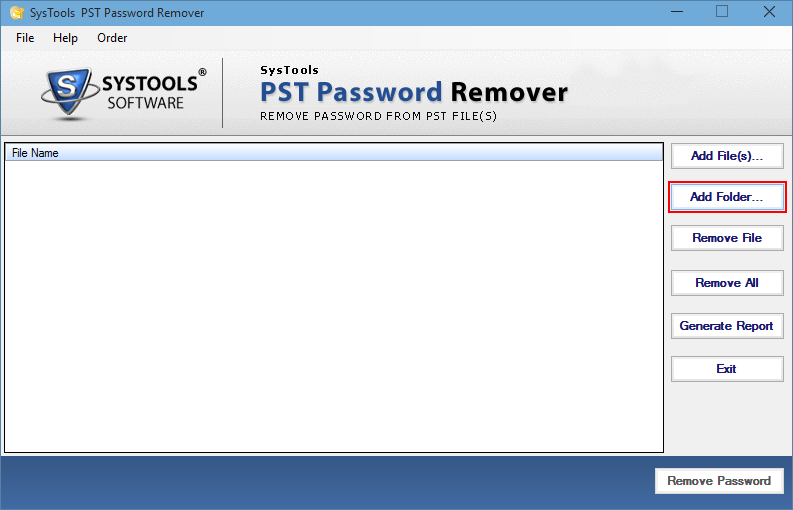 The Outlook PST Password Removal tool can be installed on all versions of Windows Operating System. In addition to this, both ANSI and Unicode type PST files can be added for password elimination through the tool. The software ensures to remove PST password without making any changes in the PST file database. For forensics examination, it is necessary that metadata remains same so that evidence extraction can be done easily and efficiently.